Somewhere between 70 and 75 percent of the earth’s surface is covered with water. The same water that existed on the earth millions of years ago is still present today. Beaver Lake Arkansas Our drinking water comes from Beaver Lake. Help keep Beaver Lake clean. The daily requirement for sanitation, bathing, and cooking needs, as well as for assuring survival, is about 100 gallons per person. Water is part of a deeply interconnected system. What we pour on the ground ends up in our water, and what we spew into the sky ends up in our water. Bottled water produces up to 1.5 million tons of plastic waste per year. That plastic requires up to 47 million gallons of oil per year to produce. Bottled water isn't a good value. Bottled water sells for about 5 cents an ounce. Most municipal water costs less than 1 cent per gallon. SPRINGDALE, Ark. 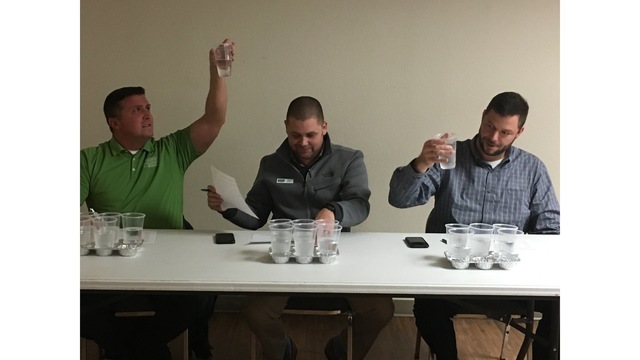 (KFTA) – Springdale Water Utilities took first place for best tasting drinking water during the monthly meeting of the Northwest District of the Arkansas Waterworks and Water Environment Association (AWW&WEA). Springdale Water Utilities will now compete for the statewide award during the 2019 Annual Conference & Exposition of AWW&WEA, which will be held April 28-May 1 in Hot Springs. Bella Vista Water Association took second place. Other competitors included Beaver Water District, Rogers Water Utilities, Washington Water Authority, and Holiday Island Utilities. Past winners include Rogers Water Utilities (2018), City of Bentonville (2017), Rogers Water Utilities (2016), Prairie Grove (2015), Beaver Water District (2014), and Rogers Water Utilities (2013). E-Statements - Log in or Enroll for Paperless Billing.